The 2017 Ford Fusion Gets Rave Reviews Across the Board! You Are Here: Home > The 2017 Ford Fusion Gets Straight ‘A’s! The 2017 Ford Fusion Gets Straight ‘A’s! Sure, you’ve heard all about it: the 2017 Ford Fusion gives you some of the very best performance specs available, from engine power to a raft of driver assist features. And sure, you’re heard about this vehicle’s awesome technologies and safety devices, as well. But did you know that the Fusion has also received some of the best reviews of any new car? Read on to see just how excited industry-leading publications like Edmunds, The Car Connection, and Kelley Blue Book are about the new Fusion! Let’s just take technologies: in the Fusion, you’ll get SYNC technology, SiriusXM Satellite Radio, SYNC MyFordTouch, and even a Voice-Activated Touchscreen Navigation System. 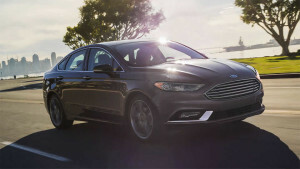 For example, the Fusion gives you Lane Keep Assist, Cross-Traffic Alert, a Blind Spot Information system, a rear View Camera, and an assemblage of powerful airbags. Check out what the Ford has to offer in engine power, for example. You can choose from engines ranging from a Fusion’s 1.5L Ti-VCT i-4 EcoBoost engine with Auto Start-Stop, to a 2.0L Ti-VCT GTDI i-4 EcoBoost engine, to a 2.0L Atkinson-cycle Hybrid delivers 43 mpg in the city and 41 on the highway. And that’s just the beginning. Test Drive the 2017 Ford Fusion Today! Best of all, you don’t even have to take or word for all this. Simply stop by our Glenwood Springs Ford dealership any time in order to take this car out for a test drive. Located at 55 Storm King Road in Glenwood Springs, we can also be reached at 970-945-2317 or via this easy-to-use online form as well. Don’t delay any longer: find out what makes the critics love this vehicle by visiting Glenwood Springs Ford!